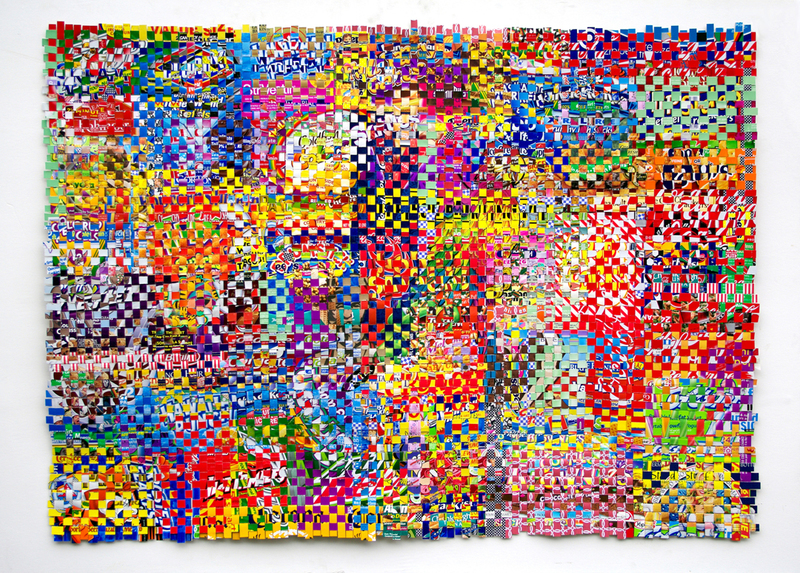 Jonpaul Smith utilizes found objects and discarded commercial waste, cutting them into strips and weaving them by hand to create large compositions. Despite the complex structure and the deconstructed nature of the materials, recognizable images and lettering appear throughout the work, and the actual process of making is quite simple. The ability to recognize a brand or product by only a partial label shows how powerful and popular today’s consumer society, and the new images he constructs maintain the same boldness present in modern advertising. He keeps his scraps filed by color in a milk crate, making it easier to select his materials to include in a work. 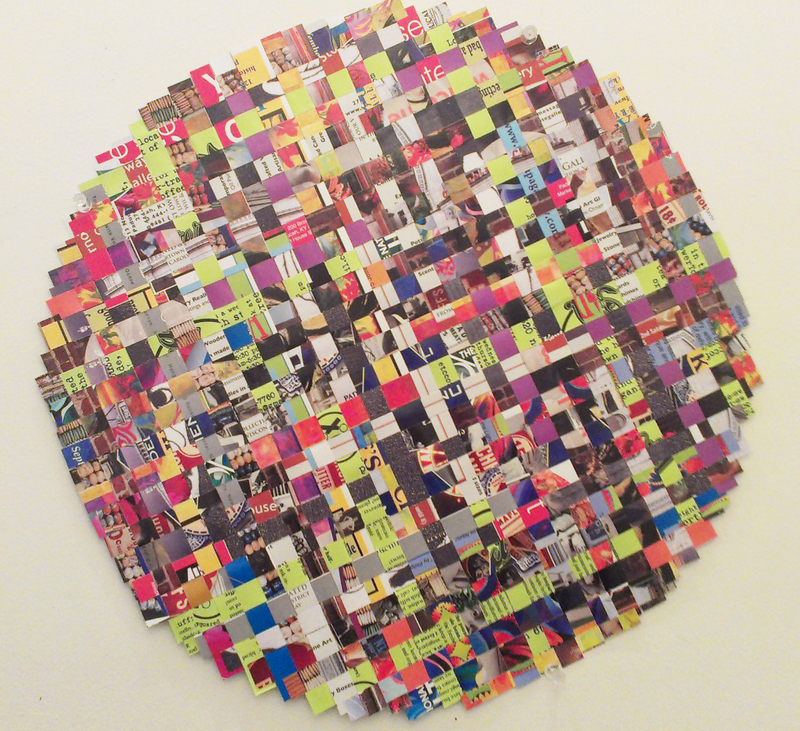 During his residency, Smith has focused on creating new, smaller works utilizing a variety of discarded materials and brightly patterned origami and scrapbook papers. These smaller works are woven together using much smaller strips in order to create a similar visual effect as the larger works. The woven surface of Smith’s work adds dimension to a piece and creates a vibrant play between color, texture and pattern. At his opening reception, I immediately notice a piece created from the Paducah brochures from his welcome packet. The area’s rich textile tradition is naturally incorporated into the woven structure. When I meet with Jonpaul, his sketchbook catches my eye. 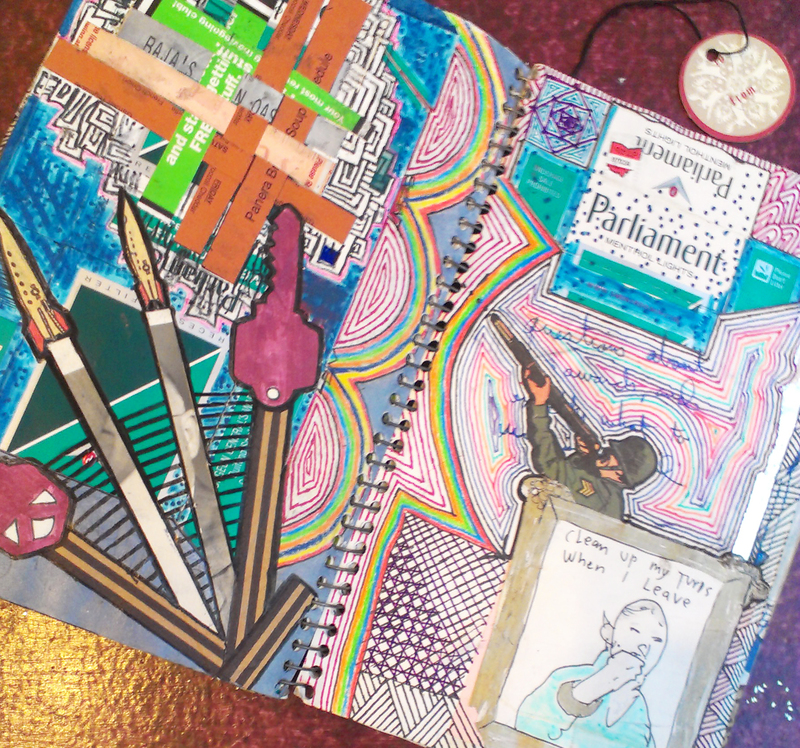 The pages are thick with drawings that are heavily collaged with pieces of paper, wrappers, and woven bits of paper. His sketches document more of his thoughts and his humor than the large works do, and looking through it I get a better sense of his personality. His small drawings are bold, complex, and playful. Jonpaul Smith is an established artist from Cincinnati, Ohio. He is formally trained as a printmaker and holds an MFA from the University of Cincinnati’s College of Design, Art, Architecture and Planning. He is the Artist in Residence at A.I.R. Studio through October 28th. To see more of Smith’s work, visit his website at www.jonpaulcsmith.com.